Somehow, a superfood that only health advocates like me have known about for years is now common fare for a wave of twentysomethings eating at trendy coffee shops and delis. Although there is no accounting for taste or trends, quinoa does have some powerful health benefits. It tastes great, it is high protein, and it is part of another major food trend of today: gluten free eating. Somehow, a superfood that only health advocates like me have known about for years is now common fare for a wave of twentysomethings eating at trendy coffee shops and delis. Although there is no accounting for taste or trends, quinoa does have some powerful health benefits. It tastes great, it is high protein, and it is part of another major food trend of today: gluten free eating. 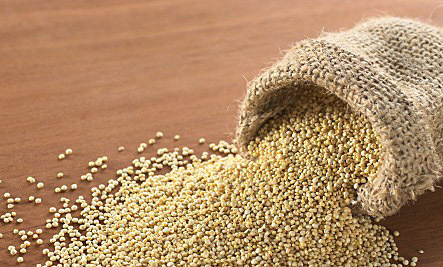 Although referred to as a grain, quinoa is actually a seed from a vegetable related to Swiss chard, spinach and beets. Quinoa is pronounced "keen-wah," not "kwin-oh-ah." Learn its benefits, ancient history, preparation tips and cautions. 1. High in protein -- its protein balance is similar to milk and has more protein compared to rice, millet or wheat. 2. A good source of riboflavin -- riboflavin helps reduce the frequency attacks in migraine sufferers by improving the energy metabolism within the brain and muscle cells. 3. The saponins from quinoa are used to promote healing of skin injuries in South America, making it a good antiseptic. 4. It's alkaline-forming. Although it is not strongly alkaline-forming, it is comparable to wild rice, amaranth, and sprouted grains. 5. It only has 172 calories per ¼ cup dry quinoa. 6. Since it is not related to wheat or grain, it's gluten-free. Millions are discovering they feel better and lose weight when they reduce gluten grains or at least wheat products. 7. It is a complex carbohydrate with low glycemic index. This is again good for weight management. I use it in a number of my health Boot Camps. The Inca referred to quinoa as the "mother seed," and considered it to be sacred. They grew quinoa in South America in the high altitude of the Andes. It was also their staple food for 5,000 years. The Spanish conquistadors, not knowing its value, almost wiped out quinoa by making it illegal for Native Indians to grow. In the 1980s, two Americans rediscovered quinoa and started growing it in Colorado. Quinoa is coated with toxic chemical called saponin. It is therefore important to rinse quinoa thoroughly. And moderation is key -- even with healthy superfoods -- so it shouldn't be eaten every day. A few times a week is enough. Although quinoa is not a commonly allergenic food and does not contain lots of purines, it does contain oxalates. This puts quinoa on the caution list for an oxalate-restricted diet. The sticky, bitter, soapy film of saponins also keeps birds from eating the quinoa seeds off of the bushes. Scientists decided to create quinoa that didn't have saponins, and guess what? The birds ate it all. More than 200,000 pounds are grown each year in the US Rocky Mountains. Quinoa is the sweetest tasting when grown above 12,500 feet.